Homespun Stitchworks..... For the love of vintage: Lazy daisy stitch. 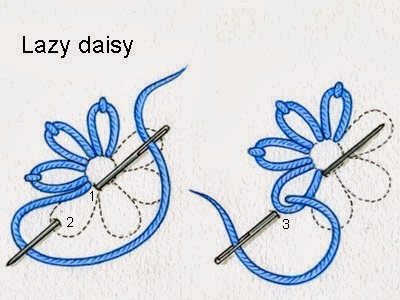 I am talking lazy daisy stitch today. Its very easy and it looks very good. You can make beautiful flowers with it and always do French knots in the middle. I know I keep on about variegated threads but it would really work on this stitch. I was studying a daisy the other day.... now when you pass one by its white with a yellow middle and green stem, but no in the white there is a little pink and light lilac in the petals. So it goes to show that in petals in general there are little variations of colours. You can fill a lovely space with this stitch or stitch a basket and fill it with flowers. I am a slight addict now of embroidery and may well book myself into a course to learn more stitches and there history. If you are inspired then give it ago, you could brighten up a pillow case or indeed create a picture for your self. I did not stitch this but isn't it pretty. 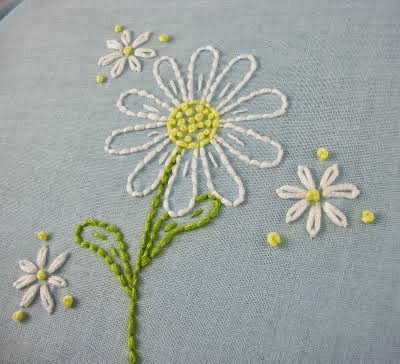 Only three stitches here, French knot, lazy daisy and running stitch.